The early bird gets the worm – according to the old saying. But if that early bird is worm-hunting in your yard, then it should also get a nice morning shower. That’s because early morning is the very best time to water your lawn. And with your automated lawn sprinkler system, doing what’s best for your lawn won’t require that you join those early birds in rising with the sun. Watering your lawn early in the morning is a great way to conserve water. Winds are usually light at that time of day, and temperatures are at their lowest. So you’ll lose little of your water to evaporation. And light winds also mean that your water will be applied in the pattern for which your system was designed – no water blown onto sidewalks, driveways or streets. But watering early in the morning also offers some significant health benefits for your lawn. One common enemy of turfgrass is fungal disease. And keeping your lawn wet for long periods by watering in early evening or at night makes your lawn a prime target for fungal nasties. Watering just as the sun is rising assures that your lawn foliage will dry quickly, preventing fungal organisms from rooting in. And watering early in the morning also fortifies your lawn with a good supply of water just before it will be needed, during the heat of the day. 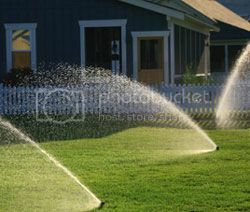 Though early morning is the best time to water your lawn, your sprinkler system shouldn’t be going off every morning. Experts agree that infrequent, deep waterings are far more beneficial than daily waterings. Occasional, deep waterings help to promote healthy, vigorous plants by encouraging the roots to grow deep. For established lawns, try to apply about an inch of water per week in one good, deep soaking. With rain, of course, the amount of water you’ll need to apply through your irrigation system will be reduced. The exception to the once-per-week rule applies to newly seeded lawns. Germinating seeds and young seedlings must be kept moist, so plan on watering several times per day until the grass has become established. Thanks to your automated lawn sprinkler system, you won’t have to become an early bird simply to do the right thing for your lawn. No rising with the sun just to manually turn on your lawn sprinklers. You can sleep right through the crack of dawn, and leave the early bird stuff to your feathered friends – and to your bleary-eyed neighbors who aren’t smart enough to have an automated sprinkler system! This entry was posted on Sunday, July 21st, 2013	at 8:00 am	. You can follow any responses to this entry through the RSS 2.0	feed. Both comments and pings are currently closed.